States have notable geographical landmarks. New York has Niagara Falls. Minnesota has 10,000 lakes. Arizona has the Grand Canyon. Florida has the Everglades. And Washington has Mt. Rainier. When my father bought a lot outside of Bremerton, Washington, he made sure that our house took full advantage of our view. The house sat on a hill overlooking an inlet of the Puget Sound. On a clear day, Mt. Rainier rose on the horizon like the top of giant ice cream cone. Granted, clear weather comes at premium in Western Washington with the weeks of grey, low clouds obscuring all mountain vision. Yet when the clouds cleared, the mountain was always there, sunlight gleaming off the multiple glaciers. In high school and college, I remember sitting on our deck, transfixed by the magenta alpine glow on Mt. 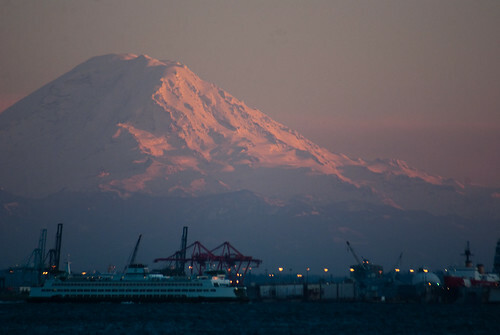 Rainier at sunset. When I decided to do the southern section of the PCT this summer, I deliberately chose to hike from south to north for the explicit reason of hiking towards Mt. Rainier. Though I would be hiking near Mt. Hood and Mt. St. Helens, and directly beneath Mt. Adams, my heart and eyes were focused on Mt. Rainier. And I was not disappointed. As mentioned in my previous post, my first two and half days were mostly in the forest. But on my third day, as I climbed the ridges surrounding Mt. Adams, I caught my first glimpse of Mt. Rainier. For the next four days I played a game of hide and seek, wondering where the next view would come. There were several from Mt. 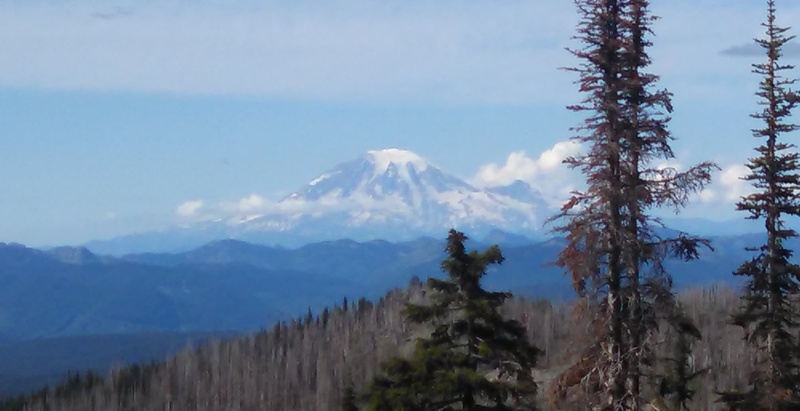 Adams, but the best view of Rainier came when I entered the Goat Rocks Wilderness Area. Though the haze and midday sun made photography difficult, I made sure my final lunch stop included a Rainier view. After such splendid views, I started to think again about hiking The Wonderland Trail. Its 93 miles circumnavigates the mountain and offers many elevation challenges as one hike up and over the many ridges that radiate out from the peak. Due to its popularity, access is limited to a kind of lottery system in reserving backcountry campsites. But now I am convinces it would be worth the gamble. I often use Mt. Rainier as part of guided meditation prayer that helps me stay grounded in Christ. Also I sing a song based on Psalm 46. “Great is the Lord, and greatly to be praised. In the city of our God, in the mountain of his holiest, beautiful for situation, the joy of the whole earth – is Mt. Zion on the side of the north, the city of the great king.” From an early age, I have associated Mt. Zion with Mt. Rainier, both places of beauty, elevation and holiness. And I know the mountain has brought me much joy. Lord Jesus, thank you for the holy places in our lives. 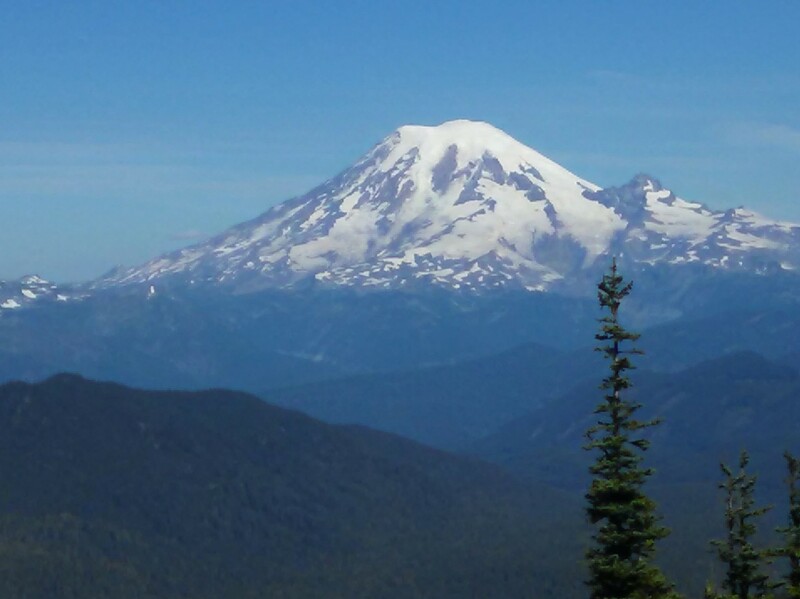 This entry was posted in Prayer, Uncategorized and tagged backpacking, Mount Rainier, mountains, Pacific Crest Trail, Psalm 46 on September 10, 2014 by Pastor John Keller.